Sometimes it’s easy to see why almost no one uses Linux on the Desktop. I just got a Spotify invite, so I decided to try it out. Step one is registering at Spotify.com. No trouble! But then… how do I use it? Ah! The download link! Sweet! A Linux preview! It’s available for Ubuntu and Fedora. Hey! I run Fedora! Awesome. Except, there isn’t a package available. The directory is empty. Okay. So I download the Ubuntu package and use Alien to convert the file. Amazingly, it installs! Oh. Linux Desktops are considered devices, not desktops. You need to buy an ultra-premium service to use a device. (OTOH, then I could use Spotify on my Android phone as well.) But, since I haven’t even been able to try this service yet, spending $$$ seems premature. Okay, so the other option is to run the Windows version in WINE. (a windows emulator) Blech. But okay. I run it, and get myself logged in with a small amount of fuss. Until I try to play some music. Oops! Nothing plays at all! Oops! I need to read the directions to add a sound device for the Windows emulator. Of course, the directions are out of date on the Spotify web site. I need to add the “PulseAudio” driver with Full Hardware Acceleration. It works! Until I try to play my own music on Spotify. Oops! And now it works. Hopefully Spotify is worth it. How many people could have gotten through all those steps? Works for me on Fedora 15 x86_64 with 0.5.2.84 native x86_64 version (http://repository.spotify.com/pool/non-free/s/spotify/). There was Fedora build in June but it was outdated and few versions behind Ubuntu build. 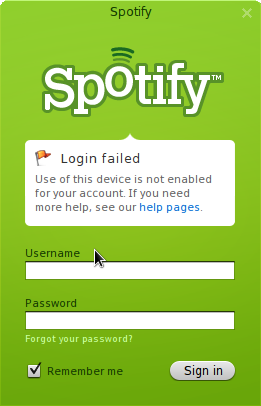 Alexander, the Linux Spotify client claims that my “device” is not authenticated. Are you currently paying to listen? Why should Linux users pay when no one else has to? This is known thing — Linux client requires premium account. (and, I guess, they cannot guaranty system protection, whatever that means — Premium gives you offline playback too). On the other hand, there is opensource Spotify client on N900 that works with premium account. Yes, I do pay for it. Being able to download and listen without being connected to a network is good. For classic music I find my 9.99/month subscription more suitable than buying overpriced CDs (starting from 18-20EUR/CD). Everyone else is using Ubuntu, so it’s kind of moot anyway. I’m sorry but this rant is a bit unfair as the Linux Desktop version of Spotify is still a beta product for the moment. The distribution model they are using for this beta version is to make it available to subscribers until it reaches the necessary quality standards in order to make it available to general public. By the way, I’m really thankful for having it and I’m happy to pay them what they deserve. Daniel, I believe my rant is fair. Here are a couple of places where Spotify went wrong: (1) listing a Linux client but not mentioning that you have to be a $10/month subscriber to use it; and (2) listing a Fedora Linux client that doesn’t exist. Once I went off the reservation and tried WINE, I guess I deserve what I get. This is a preview build of Spotify for Linux. As a preview release this version is still unsupported, but we’re running it ourselves and will try to make sure it keeps pace with its Mac and Windows siblings, there are issues regarding decoding of local music on the Linux platform so we haven’t included support for local files in this version. As we haven’t found a reliable way to display ads yet, this version is only available to Spotify Premium and Unlimited subscribers. I’m not defending them, just pointing out weak points in your rants. Happy music experience to you! anonymous – ha! I wondered if anyone would pick up on that. OTOH, it’s a pretty good description of what WINE /does/, if not how it works. If you’re using Ubuntu and paying for the premium version of Spotify the experience is much smoother and given the small proportion of Linux users and ill-will that a locked-down system to show ads might generate, it seems reasonable that they restrict it to paying customers. Just wait: next year is the year of the Linux desktop! > Sometimes it’s easy to see why almost no one uses Linux on the Desktop. I had the same, completely ridiculous experience. Sure, WINE is great and allows many people to easily run their old applications on Linux. But for something like this, it would be nice if they work out the kinks that are preventing the free version to run on Linux. I heard it had something to do with advertising not working reliably on Linux or something. Either way, I found Spotify’s selection lacking in comparison to the web-based Grooveshark. So I’m not totally convinced by Spotify, although for stuff sold in the U.S. it’s more than sufficient. Just not overly impressive. I’d rather have a Spotify plugin in Banshee/Amarok than a full application dedicated to it. Sound works for me, but I’m having problem with window rendering. When Spotify opens it takes background on the right side as part of the window and rendering is buggy overall. What version of Wine and window manager do you use? I would like to express my frustration that there is no source code available or a BIN file. I understand there are a million Ubuntu users, but why not publish the source code for the benefit for the millions of other Linux users? Seek help? Start a project with packagers from other distro’s? I myself use OpenSUSE 11.4 and converting to rpm with alien is not working anymore for me since Spotify 0.5. I think it’s a pitty the linux version isn’t made into a community effort, opensource style.